Agri AirClean clean very efficient Ammonia- and odor emmisions away. Agri AirClean is modular to accommodate the need for air cleaning in your stable. Agri AirClean is a chemical air cleaner that effectively removes ammonia and odor emissions from all stables and all breeds of domestic animals. The cleaner is particularly suitable for spot / floor extraction where the concentration of ammonia and odor is particularly high. Agri AirClean is designed to be used in open stables, also cow stables, and therefore low temperatures do not prevent the air cleaning. After a stop, the cleaning process can be restarted with full power and is therefore particularly useful in all outputs in production of, for example, finishers. Agri AirClean makes it possible to gather more animals on fewer production units, thereby supporting efficient and economically sustainable livestock production, and better utilization of employee resources, benefiting your bottom line. 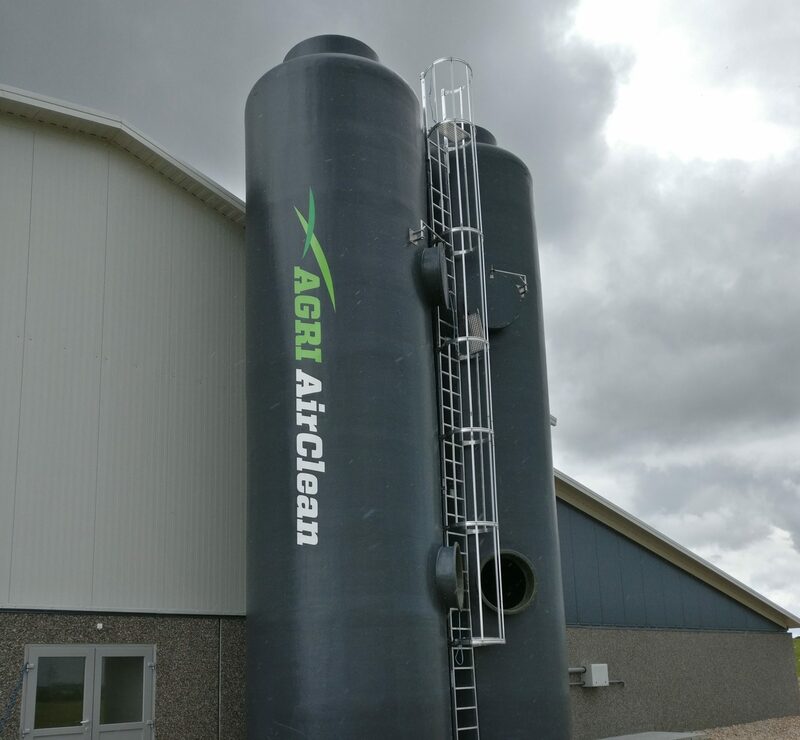 You produce your own NS fertilizer of the spared ammonia and chemistry, and therefore the Agri AirClean is an economically efficient air cleaner. Agri AirClean is controlled, regulated and monitored via the Smartfarm operating system. The function of Agri AirClean is fully automated and does not require manual control and monitoring. By Ph and conductivity measurement, correct amounts of supply of chemistry and drainage of the emitted emissions (fertilizer / waste) are ensured. Monitoring of the liquid circuit and fans ensures alarm call in case of failure.